Another February limps to a close, with a steely blue rising high above my house. Snow threatens my plans for the day, but offers incentive for me to look forward to my expensive little mini-vacation in California, three days flanking a duo of appointments with the wizardly doctors at Stanford. Yesterday, I calculated what this little trip costs and gulped as I saw my budget cushion vanish. But on the third hand, it's oh, so nice to be leaving Missouri as winter finally takes hold. An exchange of Facebook posts with my friend David Sotkowitz in Boston brings to mind the winter of 1977, when I moved to Massachusetts. I spent my first nights on David's floor on a make-shift pallet, watching snow fall past the window, cursing my impulsive departure from St. Louis, home, and safety. I would close my eyes and ask myself, was it really so bad, that you had to come to this frozen place because you had no other options? I had no answer except that it had seemed that bad, that desolate, that hopeless. With a referral letter to the offices of Boston's branch of Adia Task Force, I swathed myself in layer upon layer of wool and rode the T downtown to interview, the letter and a few copies of my sad resume shoved in my pocketbook. Adia had bought "Task Force" in an effort to compete with Kelly Girls, merging Adia's medical staffing with the clerical divisions of Task Force. They sent me out on a few jobs: To Cambridge, to work at IBM -- which lasted right up until I used the word "Xerox" to reference making a copy; to a few small offices, where my Bohemian style seemed to perplex the bosses; and finally, to their own front desk, where I became their receptionist for the duration of my nine months in Massachusetts. The trolley took me to Boston College, at which I could had access to the student services by virtue of my acceptance for graduate school in the fall. I trolled the Roommates Wanted advertisements, using their phone to set appointments. In that way, I found an apartment in Brighton, at 27 South Street, the third roommate with Long-Islander Marian Zagardo and Quincy-ite Melanie Bonfiglioli. I moved into my borrowed life with only a half-filled suitcase, grateful for the bed in their back bedroom, for the one wooden chair and the shelf in the closet. The square yellow suitcase had belonged to my Uncle John. It became my nightstand. I bought a metal rocker at a junk store and found a lamp at the drug store in Copley Square. I carried the lamp out of the store, passing beneath the sign overhead which promised MILK BREAD FRIENDS GIFTS DRUGS ETERNAL LIFE. Each day on my way downtown, I read that sign and wondered, could I really find friends there? I'd settle for friends over eternal life. I didn't do drugs, except the prescription kind, which I realized, early on, was what the sign meant. I hung out with Marian and Melanie and their theatre friends. We frequented a French restaurant where the gay waiters still caused a stir, which in our group meant the one guy who'd come out of the closet and the one guy still in the closet would flex their muscles and preen when our waiter came to check on us. We didn't care about anyone's sexuality. Except for me, everybody in the group just wanted to be seen; I wanted to be seen with them. We never slept. We partied all night and dragged ourselves to our day jobs. My position at Adia Task Force required no thought, only a pleasant demeanor. I had to answer the phone, Adia Task Force! and transfer the call to the sales rep who handled the caller's needs. Staff called into the office to get assignments; companies called to get staff. No variance. Three reps; three categories of staff; and lunch at the back table with the bookkeeper and the office manager. I could do the job hung over and usually did. On Saturdays, I took the trolley lines to their ends and walked through neighborhoods where I knew no one. I stared into windows and imagined myself at the glossy dining room tables. I haunted Harvard Square and bought cosmetics at "i Natural". I read books in muffin shops and sank into park benches and exhausted myself climbing subway stairs. I had an affair with the guy who had not come out of the closet yet. I convinced him that we'd still love him if he admitted to being gay. He wept in my arms and told his parents the next day. Or so he said. I can't remember if I gained forty pounds or lost forty pounds. By September, I had done one or the other. I felt myself falling. Adia Task Force offered me a job as the night sales rep and I had a panic attack. My boss spoke to me over the phone in the kindest of tones. You're depressed, Corinne, she told me. I think you need to go home. I called my mother, sobbing incoherently. She sent help. I fled back to Saint Louis in my brother Kevin's car. I brought back my Uncle John's suitcase, the lamp, the metal rocker, and a bag full of make-up that went bad before Christmas. Having no preservatives, it could not endure the heat of Indian Summer in the Midwest, far from "i Natural" where it had all been purchased. In the quiet of my house here in Brookside, I glance over the paragraphs that I've just written and realize these Musings have no point. My friend Vivian messaged me this morning: You should be published! and I glibly replied, I am! I have two blogs! Yesterday my friend Sandy told me that she admires my ability to bare my soul, to share things that others suppress. I look back on the seven years in which I've written these musings, the year in which I've had my other blog, and my lifetime of scribbling stories, bad poetry, and little essays in which I struggle to find a point or make one. I think about those days in Boston; about my first marriage, which hardly seems real except that so much love still lingers on account of it; about the places that I've been,and the people that I've known; and the days which I've squandered looking for something -- gifts, drugs, friends, eternal life. And then I pour another cup of coffee and think about hitting the delete key, but in the end, the story stands -- nine months reduced to a handful of paragraphs. When I close my eyes, each day of that nine months comes flooding back to me: a mosaic of meetings, and loneliness, and giddy peals of laughter by drunken actors, and days riding the T, where no one speaks, and the lights flicker on and off as you enter each station and people silently alight. An article in the Star announces that the Great Mall of the Great Plains in Olathe will close this fall, presumably a victim of changing consumer habits, the Internet, or its own cumbersome structure, depending on the commentator. I let the paper fall to the table and think about the only time I have been to the Mall, as far as I can recall. And I smile. It's 1998 or 1999. My son and his friends are seven or eight. Dennis decides we need a bizarre pilgrimage. Over breakfast we debate the options and for some reason, he chooses the Great Mall of the Great Plains. I cast my eyes his way, pushing all the doubt I can muster into my gaze but he is impervious. Patrick, Chris and Maher dance around the dining room, barely able to suppress their glee. Meanwhile, I clear the table and shake my head. It's certain to be disastrous, I tell myself. But I'm a good sport. We load the boys in the van and Dennis transfers from his electric wheelchair to the driver's seat. The backseat volume rises as the chatter escalates. The attraction of the Mall has driven the three of them into a delirium. I've stopped shaking my head and now I just feel amused. We head south. Three turns around the lot land us in a row of handicapped parking spaces. Dennis approves a space close to the door and we dropped the lift. The boys climb out, Patrick standing near the van's doors to help Dennis while Chris and Maher scramble to the sidewalk. I'm at the rear of the little group as we enter the door with a dozen or so other shoppers. The corridors loom head of us and it's immediately clear that my stamina will fail me before too long but I'm game to try. Dennis, being motorized, can keep pace with the children but I lag behind the group. We pass store after store, overwhelmed by the colors and sounds. We find a coffee kiosk and get drinks for everyone; juice for the boys, a depth charge for Dennis, an Americano for me. Standard orders. We continue our quest for entertainment. We have no genuine need to shop; we're just there for the novelty. The boys find diversion -- computers, a toy store, books. Always books. We make a few purchases on their behalf and keep going, barely a quarter way into the maze. I'm feeling the pain, now, weariness combined with the slight agitation arising from my intense, unchecked claustrophobia. I cannot see daylight. I might as well be underground. My heart beats so loudly that I begin to apologize to strangers in muttered tones. At the top of a long pitched walkway, I give out. Dennis says, Here, babe, sit in my lap, and the boys crow. The thought of Auntie Corinne -- Mom -- tooling through the Mall ensconced in the Gimp-mobile seems to delight them and I realize, suddenly, that I really have no choice. I can insist we leave or take the offer. I sit, and we start down the ramp, which seems to be taking us from one end of an impossibly long hallway to the other. The boys scamper ahead. Then Dennis says into the back of my head, To hell with this tortoise speed, let's go to Warp Drive, and reaches around me to the controls. Suddenly, we're dodging and darting around walkers on the ramp and the boys have started running. They squeal, Dennis pushes the joystick, and I hang onto the arms of the chair and try to remember the words to the Hail Mary. I get as far as full of grace but can't remember anything else so I repeat the first line over and over as we pass startled shoppers with frightened looks, pulling their bags and their children out of our path. Hail Mary full of grace, Hail Mary full of grace, HAIL MARY FULL OF GRACE. I see the boys jumping up and down and waving their arms, just around the bend of the walkway, where the railing ends. I don't think Dennis sees them and I try to speak, but I'm pinned against his chest and there's no air in my lungs. I'm still praying. My hair whips back, my purse strap breaks, and I clutch my jacket around me thinking, I'm going to die! and then we hit the bump and I go flying. I land on the cold tile of the floor and the corridor falls silent. The boys hold themselves completely still as Dennis cruises to a stop and shuts the chair off. They gaze down at me. Patrick looks scared; the other boys have blank faces. I can't see Dennis's expression but I know it will be a mixture of aggravation and wonder, Did we really get this damn chair up to its maximum speed? I pull my body to a sitting position and I feel Chris and Maher relax, but Patrick still wears a stunned expression. I'm okay, I tell him, and he helps me stand. We hover, at the end of the ramp way. The males stare at me: Dennis, in his electric wheelchair, waiting for forgiveness (which is easier to obtain than permission); Patrick, waiting for confirmation that I'm not injured; and Chris and Maher just waiting for restoration of the equilibrium. Well Geez, Dennis, I finally say. You sure know how to show a girl a good time. Just as I do now, thinking about that day, at the Great Mall of the Great Plains, so very long ago. P.S. I am but one of the five people who took the trip to the Mall that day. Each of the four others might recall this incident differently than I do. Human memories can be tricky and playful things. On a typical Saturday, my Musings consist of an account of a memory, sometimes recent, sometime distant; or of an event in my life or the life of a client or friend. I have written these Musings since the summer of 2008, when my second husband Dennis had moved out for the final time and my son had gone to Mexico with an international student exchange program. I found myself living alone for six weeks, and wondered if the hiatus from parental/spousal responsibility might have created a window through which I could step back into the life of a writer. I took a chance and I would not have continued had people not read and commented on my weekly offerings. The Musings began as Saturday morning posts to the Small Firm Internet Group, a list-serve of the Missouri Bar Association. Until recently, I still posted the Musings to SFIG and I will post this entry there as well. I had many kind readers and commentators among my colleagues on SFIG. More recently, I have just posted a link to the Musings in an e-mail to SFIG, at the same time sending the link to a group of friends and sending it out to Twitter and Facebook. I also blog on another 'spot. In January of 2014, two months after my mother-in-law Joanna MacLaughlin passed away, I began a quest in her honor to live complaint-free. I had also just quit using prescription narcotics after 45 years, a coincidence of timing that might have shown a lack of foresight on my part. It has been a challenging undertaking, and that first year bled into a second twelve-month period. I have learned some incredible truths since January 2014, not the least of which I came to know because I spent hours in the presence of my father-in-law, Jabez J. MacLaughlin, during his last months. To have been a daughter to Jay and Joanna stands among the greatest gifts that God has given me, along with being mother to my son, stepmother to four wonderful human beings, matriculating as a member of an unshakably loyal family-by-choice, and having experienced the love of a few who would not want to be singled out for accolade here but who enriched my life immeasurably. 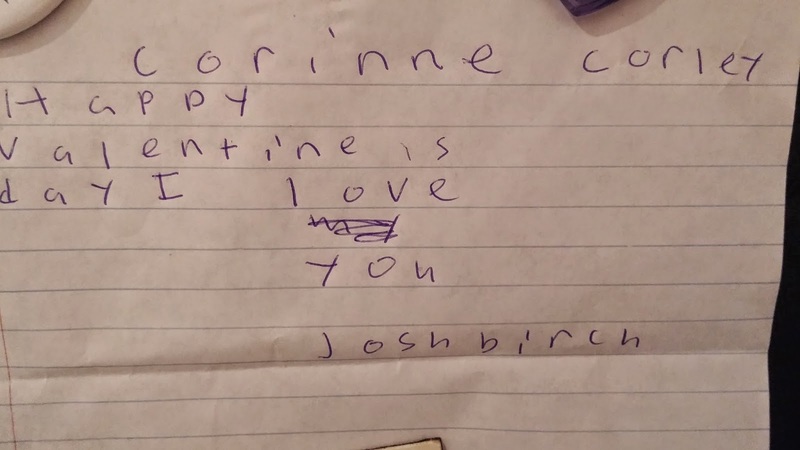 Yesterday I received a Valentine from Josh Birch, a 22-year-old man who has autism. Josh, with my friend and his teacher Jenny Rosen, walks our dog every day. The three of us went for ice cream yesterday at the local Baskin-Robbin. The clerk knew Josh; he is a regular at various establishments in Brookside, from the drug store to Price Chopper where he likes to have a chicken dinner from the deli for lunch every weekday of his life. Josh stands six-seven, thin and rangy, with bright blue eyes and a lovely shock of blond hair. His smile radiates as he enters a room. After he gave me the Valentine he had made for me, he encircled my considerably shorter and smaller body with his two long arms and said, "I love you Corinne". And so it is love about which I find myself musing today -- not because it is Valentine's Day, though perhaps something of this Hallmark Holiday sets me ruminating. Rather, I find myself musing about love because the village that has welcomed me as a lifetime citizen bestows such joy on me that I cannot avoid feeling loved. Residents of this village span the globe, from Hawaii to Massachusetts, Arkansas to England, California to Illinois, Minnesota to Louisiana. I've never filed a change of address although at times, I have skipped family gatherings from petulance or anger, in sadness or despair. No act of mine has ever proven unforgivable. The members of my family-by-choice, some of whom are biologically related to me, seem to endure any remission, omission, or injury that I inflict. On Valentine's Day in 1998, a doctor stood over me in a hospital bed and bluntly told me that he estimated my life expectancy to be six months. He could not say why I would inevitably die within that time. His best guess? That my respiratory system had finally worn out and could no longer sustain the burden of breathing. Less than a year later, that doctor and another of like-mind loomed over me as I lay in a hospital bed, arguing with Joseph Brewer, an Infectious Disease doctor who thought he knew what ailed me. The two physicians intent on allowing me to languish stood on my right; Dr. Brewer on my left. Ashen, bloated from steroids, weak, I lay under a thin blanket listening, finally blurting in a trembling voice: "Stop! Stop it! You -- you two -- you think I am going to die? You are fired! You, Dr. Brewer, you think you can save me? I choose life! You're hired!" Sventeen years have gone by since the initial prognosis on that lonely February 14th. The doctor who made that prognosis has died. Joe Brewer proved to be correct. I ailed not from collapsing lungs but from hypercoagulability related to my viral condition. He put me on blood thinners, and I recovered. In more recent years, new symptoms related to the virus have plagued me, but I learned a valuable lesson and sought meaningful help. Now I have come under the care of an I.D. doctor at Stanford Medical Center, who conducted the clinical trials which resulted in the use of Valcyte, a drug created to treat HIV, for people with my precise virus. After seventy days on Valcyte, on the 17th anniversary of my having been given six months to live, I find that I might just survive. Possibly: Even thrive. Happy Valentine's Day, Everyone. My wish for each of you is that you, too, realize that you are loved. By someone; somewhere; and probably by many people in many places. That realization should sustain you through any dark, embittered hours that might haunt you. The knowledge that you are loved should also enable you yourself to love -- without reservation, without fear, and without expectation of any return other than the sheer pleasure of the experience. 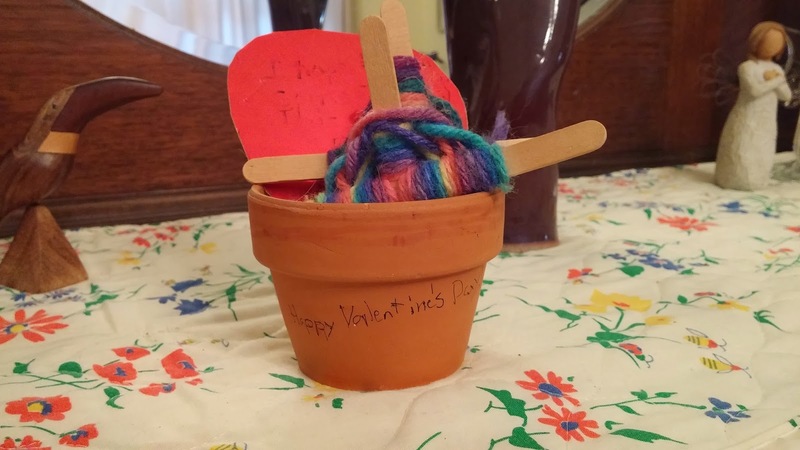 My son gave me two God's Eyes, a sweet card, and a little pot for Valentine's Day in 1998. Some one, probably Katrina Taggart or Mona Chebaro, brought him to the hospital to give it to me. The little red card says, "I hope you like what I was able to give you". I did, indeed; the gift inspired me and still sits on the window sill in my breakfast nook. Here is my Valentine from Josh Birch. I love you too, Josh. Last evening a fluttering bird beat its wings against my rib cage. With my palms pressed to my chest, I moved my neck in a feeble attempt to imitate the motion that should help calm the rapid beating of my afflicted heart. Of course I have "SVT", annoying though not fatal; and of course, I have a type of SVT that cannot be fixed, located in a place in my heart that cannot easily be reached, even if a doctor's ministration could remedy the problem. For another problem I have nitro-glycerin, but this little bird-dance inside my heart cannot be remedied. I wait it out and fall asleep to its erratic rhythm. I dream of my mother, but the unfolding is less a dream than a cherished memory. We walk down the street of my childhood, McLaran Avenue in Jennings, Missouri. Mother wears her hair in curlers held by plastic picks, with a bandanna tied around her small head. Her olive, blotched skin shows keenly in the evening light, but I cannot discern her liquid brown eyes behind her glasses. I see her smile and know its light gleams upward. As we walk, I set the pace. My legs falter but her bearing has an enviable sureness. She lets me lead, though; and so we stroll rather than stride. We do not speak at first, but I feel my mother waiting. I have come to visit her because something troubles me. I live in the city, near my college, in a small apartment. I drive a little MG and I have parked it outside of the house. She met me in the yard, embraced me, and said, Let's walk. And so we are walking. Fall surrounds us. The neighborhood's trees shake their finery in the breeze which has not yet settled to sleep. The light still plays to the west, as we crest the hill near the public elementary school where my siblings and I played as children. The wide expanse of the school's hilly yard has not yet turned brown but the leaves which have begun to fall from surrounding maples skitter across the blacktop where the teachers park. Mother and I stop at the stairs on the south side of the building. I lean against the yellow brick of the retaining wall and Mother settles on a step beside me. A few moments pass. I know she has chosen to give me whatever time I need, whatever space it takes. At the house my father will be doing the dishes. I can picture him standing at the sink, gazing out the window at the neighbor's house. He knows his youngest daughter must be troubled, because Mother has told him, Let me talk to her, and left him to worry. He'll pause with a dish in his hand and the water running, lost in blame, lost in shame, lost in a fog of worry about whether what he's done to us might be causing me to be less than able in my dealings with the world. But I won't know about his castigation of himself for many years, and on that night, the night which I envision so vividly it might be a movie, my troubles don't seem to have anything to do with my father. As the darkness gathers around my mother and me, I feel tears trickle down my cheeks. Their saltiness reaches my lips and falls to the brick. Mother stands, then, and puts her arms around me. She remains silent. I start to speak but cannot. Eventually, a long shudder roils through me, and my mother knows that I have come through the worst of my grief. I tell her of my terrible loneliness; of my differences; of my feelings of isolation. We sit on a bench on Sunbury Avenue, facing the houses which flank the street across from the school. We can see families through the picture windows. In one house, I babysat during high school in exchange for piano lessons. The children whom I watched must be in high school, I think, as my mother pats my hand. She still has not spoken other than a few murmured words between my sobbed confessions. But there is nothing for her to say, and she knows it. Because I am different: I walk funny; I have a weird health condition that no one will understand for several decades; my hair is heavy, long and curly in an era when whip-straight was the fashion. I'm clumsy, and clingy, and smart. Smart women won't be truly appreciated until the 1990s, some fifteen years later. As for clumsy and clingy, they'll never be in fashion and I can only hope to outgrow them. Mother knows this. She listens. I talk. Eventually, I run out of words. We stand and begin the walk home, north for a half-block then east, back down Kinamore, across McLaran, down our steps. My father sits in a metal lawn chair on the front porch, smoking. He has turned on the porch light, which I spied halfway down the hill. My heart feels lighter. My father says, there's cake, and my mother raises her eyebrows in my direction. We go into the house and my mother says, Do you want to stay here tonight? and I think, yes, yes, tonight and forever. I smile at them both, as my mother brews a cup of tea, and my father slices the cake. Guess what the secret ingredient is, my father says, as he always says when he has baked a cake. And then I laugh, and suddenly, I am awake.